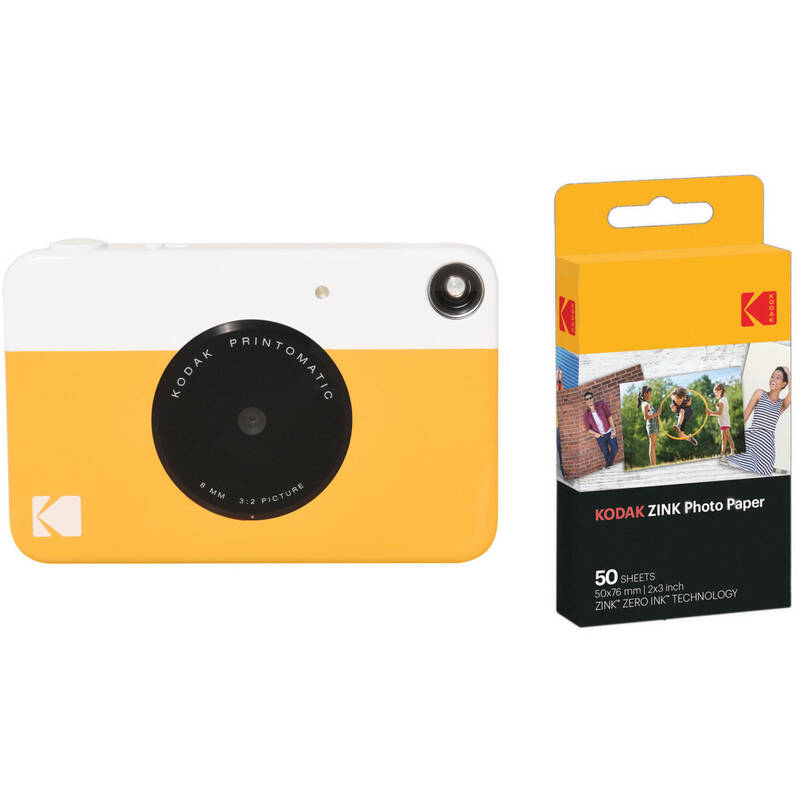 Comprising everything you need to shoot and instantly print out photos, the yellow Kodak PRINTOMATIC Instant Digital Camera with 50 Sheets of ZINK Paper Kit bundles the unique compact camera with a 50-sheet pack of ZINK photo paper. Mixing the fun of instant prints with the convenience of digital, the yellow Kodak PRINTOMATIC is a digital camera that can produce instant ZINK prints. Using a 10MP image sensor and wide-angle f/2 lens, the camera records digital images which are then automatically printed as 2 x 3" prints for sharing, as well as saved to a microSD card. The camera's simple point-and-shoot design features an optical viewfinder for intuitively composing images, has both black & white and vibrant color shooting modes, and has a built-in flash for working in low-light conditions. The built-in rechargeable lithium-ion battery can be charged via USB and integrated indicators are available to relay low battery power, printing media, and memory card storage levels. For use with ZINK-compatible cameras and printers, this 50-sheet pack of 2 x 3" ZINK Photo Paper from Kodak allows you to create vivid prints instantly using Zero Ink printing technology. This paper is used for producing borderless photos and features peel-off adhesive backing for immediately sticking them on a wall or board for display. Also, the paper is smudge-, tear-, and water-resistant and dries instantly for handling right away. Box Dimensions (LxWxH) 6.8 x 6.0 x 2.3"
Box Dimensions (LxWxH) 4.85 x 2.65 x 0.75"
PRINTOMATIC Instant Digital Camera with 50 Sheets of ZINK Paper Kit (Yellow) is rated 3.0 out of 5 by 2. Rated 5 out of 5 by kdx220 from Most fun new camera since my Kodak Bullseye 65 years ago. What a surprise! A truly fun camera great for the over 70 generation and the kids and all in between. No real instructions so everything is a surprise. The prints with sticky back are great for creating the lost art of a family photo book. But the recorded digital jpeg images on the micro sd are wonderful. And with a 8mm f2.2 lens, huge depth of field, and photography in limited light. There is a built in light if camera senses it's too dark. Buy this camera and enjoy photography all over again. Sure, I still use the M6 and the Linhof, but this is a real blast. And it has a Black & White mode too, see image below. Rated 1 out of 5 by Daniel from terrible pictures Unfortunately the photos are not good, I do not liked it, and I not recommend.